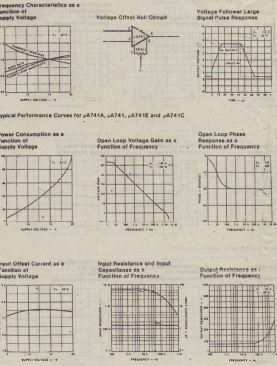 Tke values we have used for V;.” I,,, and l,.•in the examples of this section are typical for general-purpose, BJT operational amplifiers. 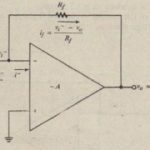 Amplifiers with much smaller input offsets are available. 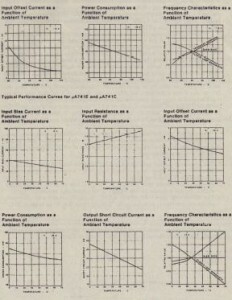 The bias currents in amplifiers having FET inputs are in the picoamp range. Most operational amplifiers have two terminals across which an external potentiometer can be connected to adjust the output to () when the inputs are grounded. 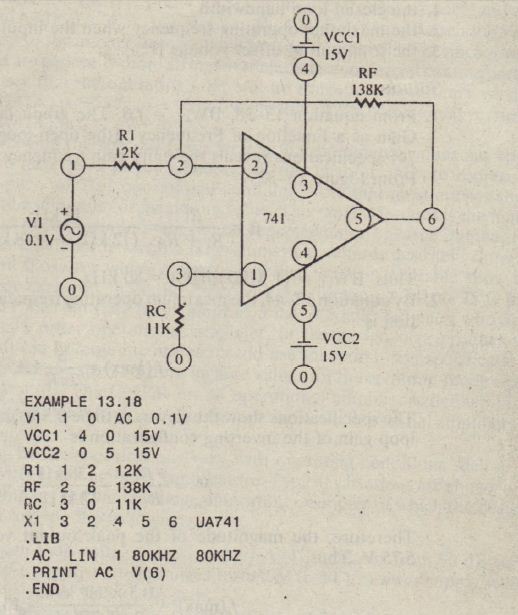 This operation is called zeroing, or balancing, the amplifier. 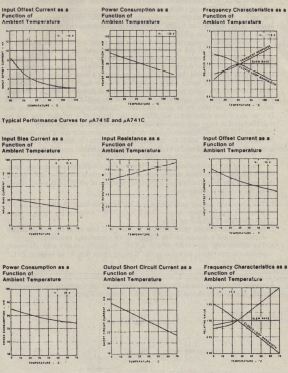 However, operational amplifiers are subject to drift, wherein characteristics change with time and, particularly, with temperature. 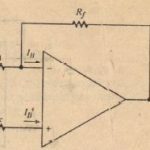 For applications in which extremely small offsets are required and in which the effects of drift must be minimized, chopper-stabilized amplifiers are available. 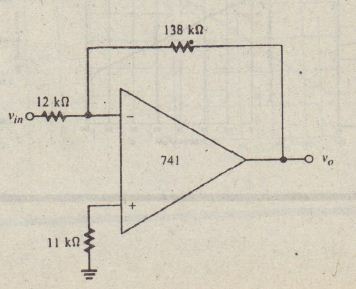 Internal choppers convert the dc offset to an ae signal, amplify it, and, use it to adjust amplifier characteristics so that the output is automatically restored to O.
shown here use the J.LA prefix to designate a Fairchild product, and data is given for the J.LA74 I,J.LA74 IA, J.LA74IC, and J.LA741E versions. Often the versions differ in respect to the intended market: military or commercial. Specifications for military versions are generally more stringent than their commercial counterparts. For example, we see that the operating temperature range for the military versions (J.LA741 and J.LA741 A) is -55°C to + 125°C, while that of the commercial versions (J.LA 741 C and J.LA741E) is O°C to +70°C. 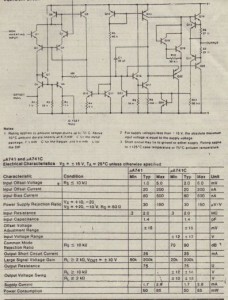 Reviewing the specifications, we see that parameter values are comparable to those we have used in the examples of this chapter and are representative of a general-purpose, BJT operational amplifier. Note that most entries show a typical value and a minimum o~ maximum value. The range of values is the manufacturer’s statement of the variation tliat can be expected among a large number of 741 chips. 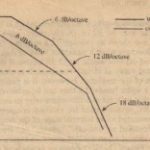 Those parameters for which a large numerical value is desirable show a minimum value and those for which a small numerical value is desirable show a maximum . value. 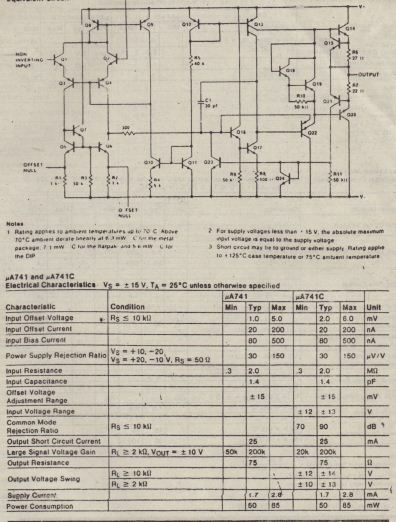 For example, the input offset voltage for the J.LA741 at 25°C has a typical value of 1 mY but may be as great as 5 mY. 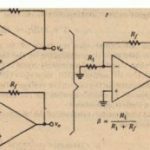 Circuit designers who are using the 741, or any other operational amplifier, in the design of a product that will be manufactured in large quantities should use the worst-case specifications. 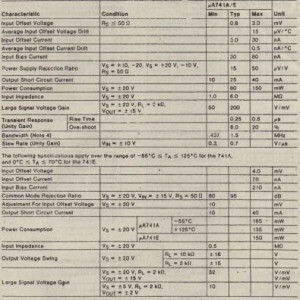 Note that the specifications include values for the common-mode rejection ratio (CMRR) in dB. 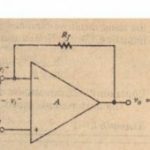 The CMRR for an operational amplifier is defined inexactly the same way that we introduced it in connection with differential amplifiers in Chapter 12. 1. 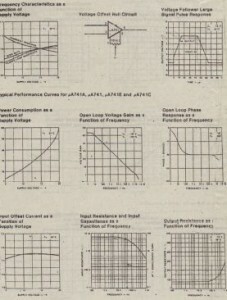 The open-loop voltage gain for the J.LA741 increases from 90 dB to nearly 110 dB as the supply voltage ranges from 2 V to 20 V. Lower supply voltages mean lower values of open-loop gain. .
2. Beyond about 100 Hz, the CMRR of the J.LA74LE falls off at the rate of 20 dBI decade, typical behavior for the CMRR of an operational amplifier. 3. The closed-loop bandwidth of. the /LA741 decreases linearly with increasing ambient temperature, its value at 120°C being about 80% of its value at 20°C. 3. the total output offset voltage IVusl . Solution“. The PSpb! circuit and input circuit lite Note that subcircuit call X I specifics till! 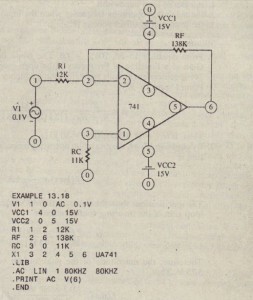 name UA 741 for the suhcircuit stored in the PSpicc library (see Appendix Section A-17). (If the Evaluation version of P Spice is used, the .LI B statement must be written .LIB EV AL.LIB.) As shown in Example 13-17, the magnitude of the closed-loop -gain is 11.5. Therefore, the midband output voltage is IA” Ieill = 11.5(0. t V} = 1.15 V. At cutoff, the output voltage should be n.707(1.15 V) = O.H13V. 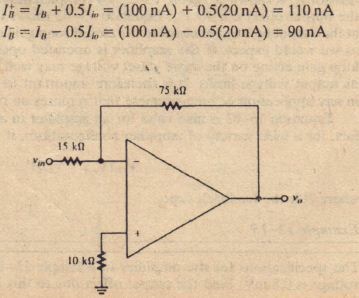 To verify the calculations of Example 13-17. the frequency of the simulation is set to the theoretical bandwidth, X()kl lz, at which the output voltage should be near 0.1)13 V. Execution of the program reveals that the output voltage at 80 kHz is 0.822 V, which differs only l.l % from n.S13 V.